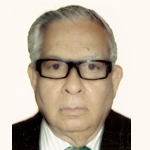 Amitabha Ghosh (84) was appointed an Independent Director of the Company on 23rd October 2001. Earlier from 26th July 1994 to 23rd October 2001 he was a nominee Director (for ICICI Bank) on the board of the Company. An eminent Chartered Accountant with additional professional qualification in Banking, he is a former Chairman and Managing Director of Allahabad Bank and a former Governor of Reserve Bank of India. He is presently an Independent Director on the Boards of Shreyas Relay Systems Ltd., Shreyas Shipping & Logistics Ltd., Zenith Fibres Ltd. and Kesoram Industries Ltd.